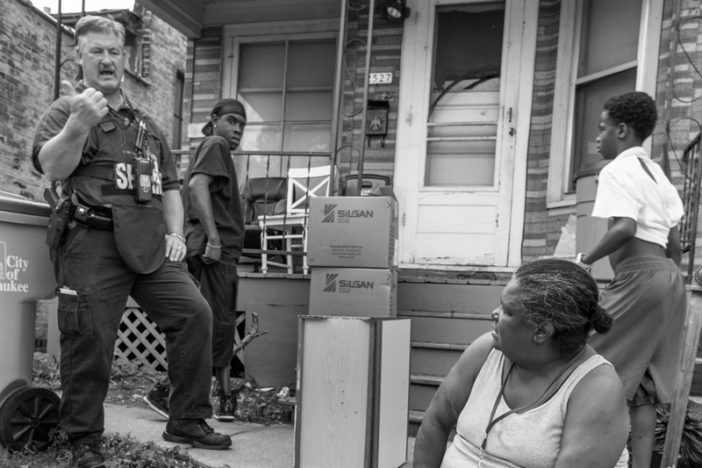 Sociologist Matthew Desmond discusses the scope of the eviction epidemic—and how ordinary people are fighting back. 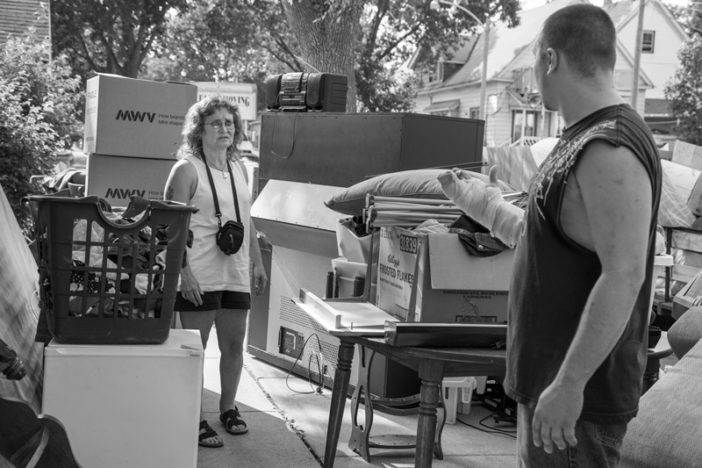 Since the publication of his book Evicted in 2016, sociologist Matthew Desmond has become the best-known chronicler of a quiet epidemic sweeping the United States today: eviction. Drawing on the book’s fine-grained account of how eviction plays out in Milwaukee, the country’s most segregated city, he has since sought to assemble a more panoramic, national picture of this crisis as the founder of the Eviction Lab, based at Princeton University. Now, the work of Desmond and his colleagues has a visual companion in Evicted, the exhibition, currently on display at the National Building Museum in Washington, D.C. (April 14, 2018–May 19, 2019). The exhibition features photographs by Sasha Israel, Michael Kienitz, and Sally Ryan as well as striking infographics and short videos. 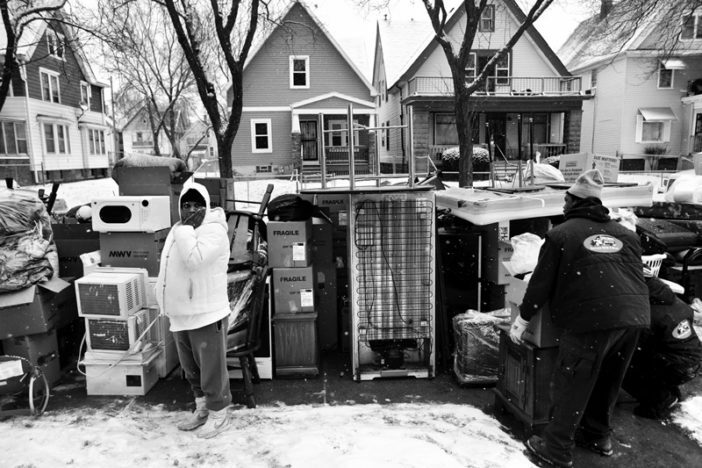 Here, we present a photo-essay adapted from that exhibition, alongside a brief interview with Desmond about the scope of the eviction epidemic—and how we might solve it. Colin Kinniburgh: Earlier this year, you and a team of colleagues launched the Eviction Lab, the first-ever nationwide database of evictions. What struck you most in your findings? Matthew Desmond: First of all, before this project, we didn’t know how many people got evicted every year. By our calculations, in 2016, 2.3 million people lived in homes that received an eviction notice. How do we get our hands around that number? That’s twice the number of people that got arrested on drug possession charges. That’s thirty-six times the number of people that died from an overdose in 2016. And 2.3 million is definitely an underestimate, for two reasons. One is that we don’t have every eviction record in the United States—we’re still missing a lot. The second is that these are just formal, court-ordered evictions. These aren’t informal evictions; these aren’t illegal lockouts or buyouts. So that number is, I think, quite conservative. The second big thing that struck me is that—you know, I spent a lot of time studying this problem in Milwaukee, and in Milwaukee, citywide, it’s about one in twenty-five renter homes that are evicted every year. I thought that was pretty high—and it is high—but we’re seeing cities in America that have double the eviction rate of Milwaukee, almost approaching triple. And if you ask where we’re seeing the crisis, it’s concentrated in the southeast of the nation—which is not where I thought we would see evictions exploding, because these are traditionally fairly low-cost housing markets. Kinniburgh: Have evictions always been so widespread? Desmond: If you read urban history and you run across an eviction scene, you are left with the impression that evictions used to be rare and scandalous. They used to draw crowds. People used to protest—they sat on the furniture and didn’t let marshals move the family out. There’s a famous scene in Invisible Man where the invisible man happens upon an eviction in Harlem, and the community’s outraged and they’re rallying around this scene, and that’s how it used to be. Since then, we’ve grown used to the knock on the door and the effects lining the curb in low-income communities. We don’t have a lot of data for this; our data goes back to 2000. What we see between then and now is a pretty consistently high eviction rate in the United States, especially in cities. So we’ve moved from a place where eviction was rare to a place where eviction is very common in the lives of the urban poor. Dissent's Spring 2019 issue, with a special section on Labor's Comeback, is out April 8. Subscribe to get your copy. Kinniburgh: Who is affected the most by evictions? 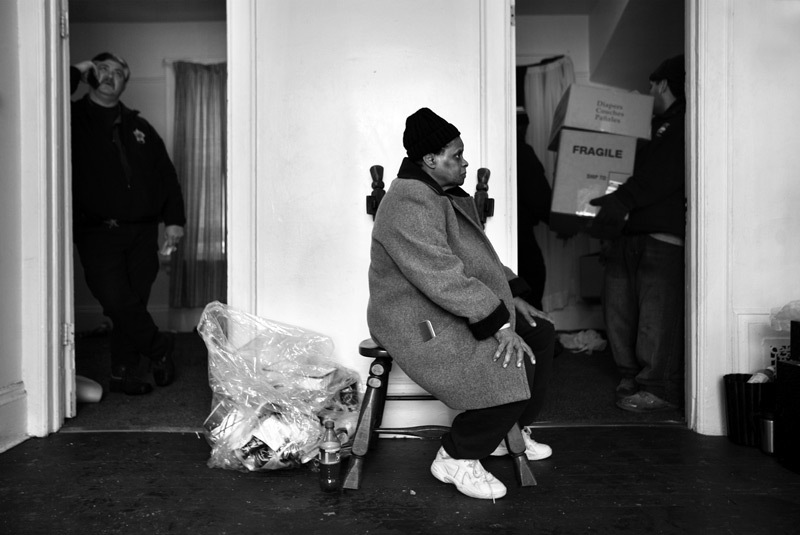 Desmond: Eviction affects the young and the old, it affects the sick and the able-bodied. . . . It doesn’t just affect people in Seattle or New York or San Francisco—cities that get a lot of play in our discussions of the housing crisis. It also affects people in Tulsa, Oklahoma, and Albuquerque, New Mexico, and rural communities, and suburban communities. If you look at rents, you’re left with the impression that the housing crisis is really a coastal crisis. If you look at evictions, you’re left with a much deeper and broader impression of where the housing crisis is. Now, who’s getting evicted? It’s moms with kids. If you spend any time in eviction court, you just see a ton of kids. Until recently, the housing court in the South Bronx in New York City literally had a daycare inside of it because there were so many kids coming through the door. 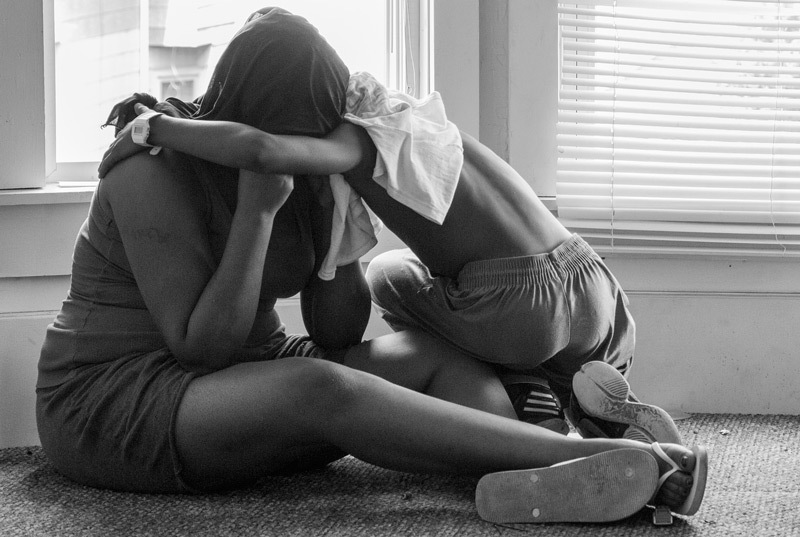 African American women and moms in particular are evicted at incredibly high rates. In Milwaukee, among renters, one in five black women reports being evicted at some time in her life, compared to one in fifteen white women. Eviction is something like the feminine equivalent of incarceration: many of our poor, young, black men are being locked up, and many of our poor, black women are being locked out. They’re disproportionately bearing the brunt of the eviction crisis. This series: eviction scenes in Milwaukee, as depicted in the National Building Museum’s exhibition Evicted. 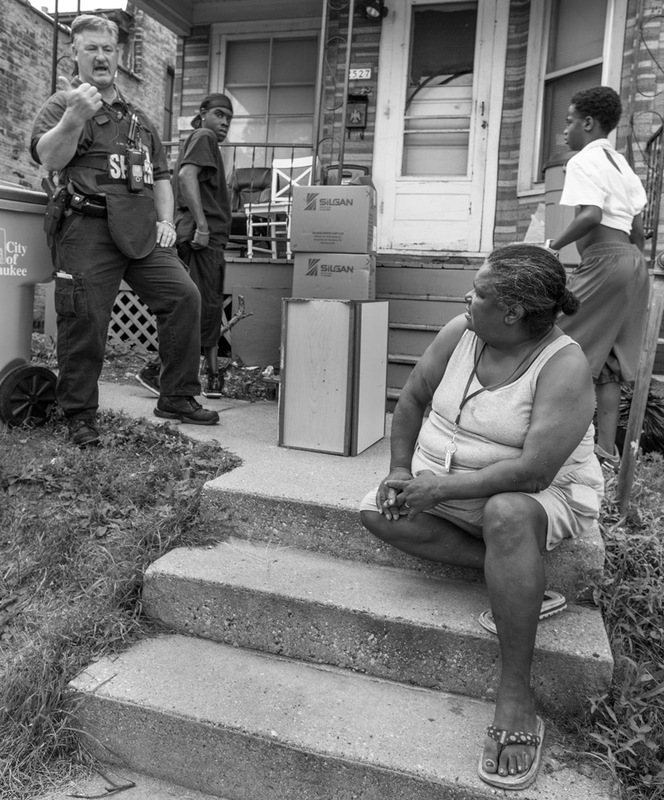 Above: A grandmother is evicted along with her daughter and grandchildren. Photo by Michael Kienitz. All photos in this series by Michael Kienitz were taken in the span of one day in August 2013. A mother and son with their belongings lining the sidewalk following their eviction. Photo by Michael Kienitz. 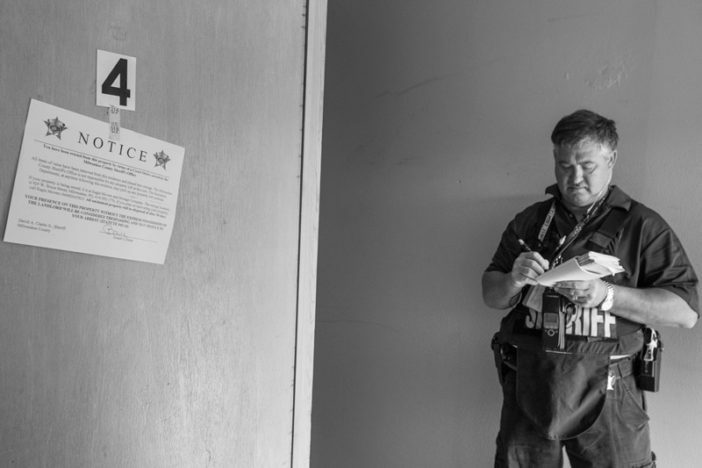 An officer from the Milwaukee County Sheriff’s Department fills out paperwork for an apartment which was vacated before occupants could be evicted. Photo by Michael Kienitz. A brother and sister console each other during an eviction. Photo by Michael Kienitz. A mother of five looks over her belongings as they are placed on the sidewalk in front of the apartment she was just evicted from along with her own mother. They were still struggling to find housing as the movers arrived. Photo by Sally Ryan, February 2010. A sixty-four-year-old grandmother watches as movers take out the furniture and belongings from the apartment she shared with her daughter. Photo by Sally Ryan, February 2010. Kinniburgh: People often think about housing as a local issue, and in turn talk about it in terms of gentrification, especially in the coastal cities. Does that framing capture the scope of today’s crisis? Desmond: No. 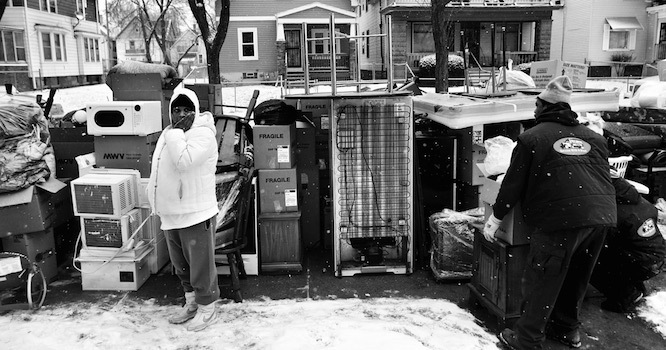 If evictions were only in gentrifying neighborhoods, there would be a lot less of them. What we’re seeing is that most evictions seem to be happening in non-gentrified, segregated neighborhoods. Even there, people are having a hard time keeping a roof over their heads. If we care about who owns a neighborhood—who gets to invest in a neighborhood, and cash in on that investment—then gentrification is an incredibly important topic. If we care about displacement, and homelessness, and people losing their communities to eviction, we have to look broader than just a gentrification frame. Kinniburgh: In addition to seeking local and national-level policy measures, are there parallels in other countries that housing-rights activists in the United States can learn from in addressing this problem? Desmond: The good news is that we can learn from each other too. There’s a lot of wonderful work going on all around the country. One thing that’s very humbling in my life is going around and talking to community organizations and people who have been working on these issues for longer than I’ve been alive, frankly, and just learning about the amazing work that’s going on block by block. There’s a lot of stuff that’s working here—it’s just the old American problem that we’re not dosing it big enough. But you’re right, we can learn a lot from other countries as well. We can learn from countries that have established housing as a right. Canada just put forth a housing platform that makes this argument very clear. In doing so, they joined a lot of other countries—some of them resource-rich countries, some of them resource-poor—that have established housing as a right. And that right can really be meaningful. If you go to the Netherlands or the United Kingdom, you’re engaging with systems that have learned to offer housing assistance at scale. You also confront housing situations that would blow our minds. In Seoul, South Korea, there’s an arrangement where, when you move into an apartment, you pay the full year’s rent—a big chunk of money—on day one. The landlord can invest that, but when you move out, the landlord has to give what you gave him or her back to you. He can keep the capital he made off the investment, but he’s got to give that initial deposit back. When you say that in America . . . our heads explode! The system that we have now is not the only system. So, I think that we can learn a lot from each other, in cities big and small, and we can learn from a lot of other countries as well—little things, too. If you move to evict me in France, there’s a mediator, so it doesn’t become an antagonistic relationship immediately. And then, the right to counsel—the right to a lawyer in eviction court—is something that’s growing around the country, in large part because normal renters, moms and dads, started working together to advocate for that right. In doing so, they’re introducing America to a place where the world has been for a long time. And not just places we usually talk about with this question. Azerbaijan has a right to counsel in housing court. Zambia has a right to counsel in housing court. This is something that America is a laggard on in the global stage. Matthew Desmond is Professor of Sociology at Princeton University and the Principal Investigator of the Eviction Lab. He is the author, most recently, of Evicted: Poverty and Profit in the American City (Crown, 2016). Colin Kinniburgh is a senior editor at Dissent. Special thanks to Sarah A. Leavitt and Emma Filar at the National Building Museum.